Folding card stock can be tricky when using machines. Folding card stock and cover stock can be difficult materials to work with. Even more frustrating is when they wrinkle up on the tabletop folding machine. Your business may not have a solution for this vexing problem. After all, you could very well be a quick copy shop or only a small printing business. Paper jams can present serious issues, especially if plastic on the folders gets in the way. In this blog we will give you four ideas for folding card stock on a tabletop folding machine. Heavier stocks are harder to handle. Find a machine that can handle these materials. If you already have access to one, then don’t wait, and just use it. If you do need to get one, used or refurbished machines are likely to be less expensive. 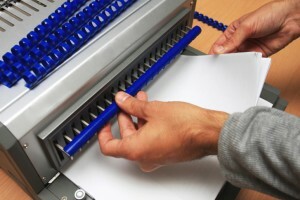 Make sure the machine you find can do the job of folding card stock without also wrinkling it. Using your hands can actually come in handy. In smaller batches, folding card stock by hand rather than with a machine may prove easier. This is perhaps the most important step. Folding card stock should actually fold. You should make sure that the creasing on it works correctly. Creasing allows the stock to fold. Another problem, known as fiber cracking, is eased by this creasing technique. Many shops seem to skip this vital step. A small tabletop machine might not be able to help you with this important stage in the process. Generally speaking, the components on a small tabletop machine, such as the accessory shafts, can’t handle the load of heavier paper. Before printing, cut off some of the stock. Size the stock against the so-called opposite grain direction. Using this technique could prove successful. If the original direction is producing unsatisfactory results, consider going against the grain. This entry was posted on Friday, February 24th, 2017	at 11:13 am	and is filed under Blog, Equipment handling, Fixing problems, Printing tips	. You can follow any responses to this entry through the RSS 2.0	feed. Both comments and pings are currently closed.